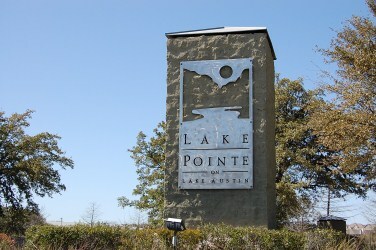 Lake Pointe is a wonderful and affordable west Austin and Lake Travis community for families in mind. It has great amenities such as community pool, clubhouse, day dock on Lake Austin, parks, and 600 acres of trails. It is located off of Bee Caves Rd. and Resaca Blvd., just north of Westlake HIlls. Students attending Lake Pointe elementary are also close enough to walk to school. Popular home builders in Lake Pointe include Clark Wilson Homes, Scott Felder Homes, D.R. Horton, Ryland Homes, and Highland Homes. There is also a very nice custom home section as well with some beautiful luxury homes with Lake Austin and hill country views. It is also convenient to shopping such as at the new "Whole Foods" market at the Hill Country Galleria and HEB grocery store. There are also a lot of great restaurants nearby. For those needing medical care, Lakeway Regional Medical Center in Lakeway is also 10 minutes away. Homes for sale in Lake Pointe typically run from the low $300's - high $700's.